Arlington officials got a taste of self-driving cars Thursday. The verdict: a little boring… but in a good way. The vehicle on display wasn’t exactly a Ferrari. It was Easy Mile’s EZ-10, something like a boxy van on golf cart wheels. French-made, the shuttle is built for “last-mile” transportation at event venues or around entertainment districts. On trips all morning and into Thursday afternoon, it rolled along from an upper parking lot, down a hill and through some cones toward the Arlington Convention Center doors, near which it parked momentarily before making the trek back. Went to see this today, didn't ride in it but watched it. It actually was fairly boring excpet that the machine was quiet and flawless in its execution. Maybe Arlington intends to jump on this. I assume these could and maybe should be autonomous when they launch. Airbus’s interest in autonomous aircraft for urban transportation has taken another step with the unveiling of a modular ground/air vehicle concept developed jointly with famed automotive design house Italdesign. Unveiled on March 7 at the Geneva International Motor Show, the Pop.Up concept vehicle comprises a two-seat self-driving passenger capsule that can couple with separate electric-powered ground and air modules. The capsule could also connect to other modes of transport, such as trains or hyperloops, proposed high-speed transit systems using vehicles running at near vacuum to minimize drag. Pop.Up adds to Airbus’s already announced plans to fly a prototype single-seat autonomous air vehicle by the end of 2017 under Silicon Valley outpost A3’s Project Vahana, and the multipassenger CityAirbus concept under development at Airbus Helicopters. Delivery drones are also being worked on by the manufacturer. The transition to driverless cars and ride-sharing could shift 1 million drivers in the Dallas Fort Worth area away from their own cars, moving 31 percent of traffic from traditional to autonomous vehicles. That’s one of the conclusions of a three-city study by transportation, economics and urban planning experts that ranked New York City and Los Angeles ahead of DFW in the movement to ride-sharing and ride-sourcing services that don’t have a driver. Your flying car might finally be on the way as the all-electric, two-seater Lilium Jet took its first test flight this week. Lilium Aviation's prototype consumes around 90 percent less energy than drone-style aircraft and could be the transportation mode of the future. The ride-hailing giant exclusively shared details of its ambitious program to start testing sky cabs by 2020 and putting them into service as soon as 2023. This is still years from becoming a reality, so chances are, other cities will also be a part of this, and DFW might not. Regardless, it's certainly good publicity to see DFW listed as the only other city, currently, other than Dubai. DFW is a perfect location for it. A sprawling city that keeps getting bigger, multiple centers of business that are all growing, massive population surge that never seems to end, HSR connection to Houston....the list goes on. This will be here sooner than anybody thinks. These things are already in the air with multiple companies vying to be the first one with a viable product. Soon enough we will see these things zooming up and down the tollway connecting Legacy to downtown, DFW, Love and other places. Fort Worth-based Bell Helicopter will partner with technology giant Uber to create air taxis, the two sides announced Tuesday at the Uber Elevate Summit in Dallas. The goal is to have the air taxis ready for testing in Dallas and Dubai by 2020. The machines, which Bell referred to as vertical take - off and landing vehicles or VTOLs, will be used for transportation and also delivery logistics services. In Arlington, driverless shuttles named Milo next month will begin whisking visitors to their venue of choice from the parking lot of the Arlington Entertainment District, where the Texas Rangers and Dallas Cowboys play. "In the next 30 days, autonomous people movers are going to be in use at Globe Life Park," Mayor Jeff Williams said in a free-wheeling discussion of the $1 billion, retractable-roof Rangers stadium and the $250 million Texas Live! entertainment complex going up next to it. I believe this will fall under Autonomous vehicle but the concept of these bee hives like towers is of more interest to me. Amazon seems to be heavily invested in the North Texas area. Hopefully we are among the first to get this technology as well. One thing that I think will greatly improve with the advent of self driving cars is road construction. If all cars on the road are autonomous, it would be much easier to temporarily divert traffic while a road is being worked on. Then they can simply shut down something like 635, work on it 24/7 and greatly expedite the construction. That might be a bit extreme because, even with self driving cars, I'm not sure if they could shut down a whole highway, but it would be very easy to measure the impact of doing so with some sort of simulator. A good overview of current development in self driving cars. Driverless vehicles are getting a lot of attention as car manufacturer Tesla Inc. (NASDAQ: TSLA) saw its market cap eclipse Detroit auto giants like Ford (NYSE: F) and General Motors (NYSE: GM) in 2017. Autonomous vehicles in the world of trucking would drastically change the industry. Autonomous truck driving within city limits will probably be the last hurdle to clear. But millions of miles are driven in rural parts of the country each year. Take, for instance, a good that comes into a port on either coast. To disperse those goods to the middle of the country, trucks have to traverse almost desolated highways for long periods of time. Embark's technology will take over driving on those open roads, and leave the city driving to a professional human hand. "I think we're closer than most people think that we are," said Gary Moore, chief executive officer at Moore Transport, in regard to driverless trucks. 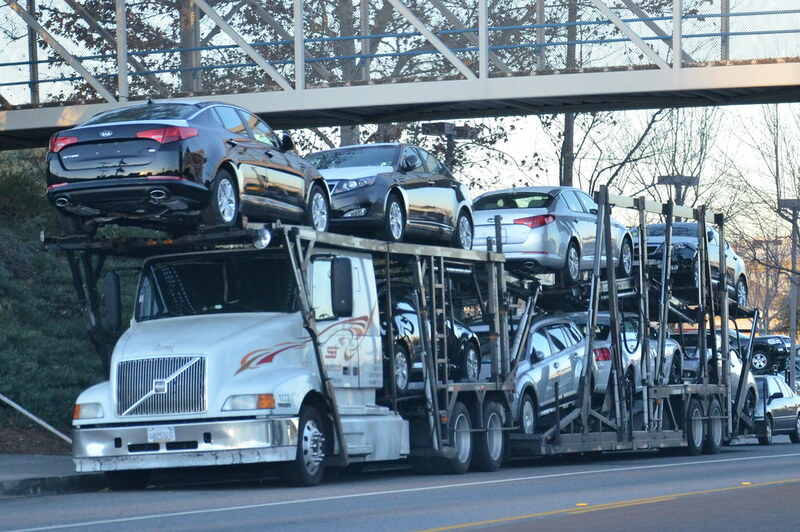 His trucking company specializes in the delivery of cars from the manufacturer to the dealership. There is a bit of discussion going on in the Amazon thread about autonomous cars, but rather than adding my post there (since it was off topic), I figured I'd just start the discussion here. I think people are focusing too much on the way cars look and function today, and don't consider that our vehicles can and will come in very different shapes and sizes. Somebody could come up with a one seater car that takes up only 1/4th of the space on the road (or even less without needing room for a trunk or engine). If all cars are autonomous, we don't need cars to 'safely' drive two cars length behind each other, meaning we are going to use our road space more efficiently. Lanes could become narrower, because computers are far more precise than a human driver, so, with all of this in mind, you've now a lot more room on the roads. They will all be networked and be able to navigate the roads much more efficiently, being able to figure out, in real time, the best possible route for all cars, and completely eliminating human intervention. Except it will be much better designed. Whenever one of these tiny one seater cars needs to go somewhere far or somewhere fast, they hop on the highway, link up to one of these 'carrier' vehicles, and then have this carrier vehicle take them farther and faster on the highways. When they are close to their destination, they will de-link themselves, and drive the remaining distance. This carrier vehicle could possible have two or even three 'stacks' of cars, which would take up even less space on the road. So basically, if there is more demand on the roads, I think it's completely fine. We will come up with plenty of creative ways to use the existing road space effectively. What I really wonder is how DFW will fare in this autonomous future. When autonomous vehicles do catch on, I would think we would be at an advantage since we have so much road space. I think we will find ways to speed up travel time as well, so sprawl may not be as big of a deal. Our sprawl (in my opinion) has hurt us in a lot of ways, but I'd like to think our expansive roads might eventually become an advantage in the future. One thing I think we will see in the next ten years over a transitional period to autonomous vehicles will be lanes designated specifically for autonomous (DFW may excel here as the toll lanes are already automated and seperated from traffic), and also areas where ONLY autonomous vehicles are allowed. The later, I see happening in areas prone to vehicle vs pedestrian accidents (center of Manhattan, or other progressive city cores would likely be early adapters). The other consideration is where most of the adoption takes place. While much of what we see today on the autonomous front is from the privately owned side (tesla auto-pilot and similar), I think the major shift will come with fleet adoption. Uber, Lyft, and my dark horse belief, PUBLIC TRANSIT. These 'fleet' adoptions won't just change how we manage vehicular traffic, but how we get around altogether. As adoption takes hold, and the numbers show how manually operated vehicles are inherently more dangerous and expensive, costs will shift against traditional vehicle operation and autonomous vehicle 'usage' (not adoption necessarily, as fewer will even own a vehicle) will take hold at an exceedingly aggressive rate. You will eventually be able to handle multitudes more 'traffic' while actually reducing the footprint of roads. I'm a fan of the car, but the name is pretty dumb. A few of the examples seem a bit ridiculous, but this just shows how much of a game changer self driving cars will be. My current car is 14 years old, and I'm really hoping it will survive until autonomous cars are available. Luckily I work from home, so my car doesn't get too much usage these days. I have a 2007 model vehicle with 115k miles (rare Dallas transit rider)... I'm going to try to squeeze another 6-10 years out of it. By then I hope EVs and autonomous vehicles start taking off. There's a lot of discussion going on in the I-345 thread. I'm just thinking that all of this would be significantly simpler once all cars are self-driving. We wouldn't have to do countless studies to guesstimate the impact, we could just run a computer simulation and see for ourselves. Also, I really think once all cars are autonomous, our roads could really be reconfigured to maximize car usage. For instance, why have such large lanes? I know right now lanes are fairly big because humans are not perfect, but with cars driving themselves, surely we could make lanes smaller and, on some roads, that might give us more room for an entire new lane. Also, I feel like having a dedicate shoulder would be useless as well. If there is ever an issue, it's much easier to tell a fleet of self driving cars to 'clear a path', so, all shoulders could be turned into another lane. I think, eventually lanes would just be eliminated, and, for highways, we could get rid of the median as well. Make the lanes more flexible. Instead of having 4 lanes always going south and 4 lanes always going north, just have one big road that will adjust as needed. In the morning, have 7 lanes go south and 1 lane north, and reverse it in the afternoon, as an example. It's a shame this is at least a couple decades away from becoming a reality, because it would make a world of difference, especially in a state like Texas where the primary mode of transportation is by car. Anyway, I kept seeing the ongoing discussion in the I-345 thread and this thought occurred to me, but I didn't want to veer the I-345 thread off topic. Lanes are wide more so because semi-trucks and their trailers are wide. A typical large sedan is 6 feet 3 inches wide, a typical large SUV is 6 feet 8 inches wide, a typical 18 wheeler trailer is 8 feet 6 inches wide. A typical city street width can be as little as 10 feet wide, leaving 18 inches left, or 9 inches on either side of the trailer that are know to sway in windy conditions. A typical interstate highway lane is 12 feet wide, leaving 42 inches left, or 21 inches on either side of the trailer. Those are standard sized trailers, not those you see on the highways with oversize load signs on the front and rear bumpers. We automobile drivers may take advantage of the wide lanes to drive weaving back and forth within our lanes, but they were built wider because the trucking industry wanted them. Ah, I see, well then I guess that sorta takes away my suggestions for 'improving' roads. But I still support the idea of removing lane all together. That allows for a ton of flexibility with your lanes, so you could still have one dedicate lane for larger vehicles and then smaller sized lanes for personal vehicles. I wonder how much would have been saved if trucking lanes and/or specific truck-highways had been built instead of building all highways to accommodate the big rigs. One thing I liked about the TransTexas Corridor plan from Former Governor Perry was the potential for cargo highways. Just like airlines and trains pay for their infrastructure, I don't know why trucking companies cannot do something similar, instead of putting the cost directly on the taxing entities. tamtagon wrote: I wonder how much would have been saved if trucking lanes and/or specific truck-highways had been built instead of building all highways to accommodate the big rigs. I suppose some space could have been saved, but I do believe having a bit of a buffer in each lane is important. Humans are not perfect drivers, so, for safety reasons, I'm not sure how much we could have 'slimmed' down. Totally different story with self driving cars though. DPatel304 wrote: Ah, I see, well then I guess that sorta takes away my suggestions for 'improving' roads. I don't think it negates your idea... If the trucks are automated as well, they simply take up TWO of the new smaller lanes (at least for interstate travel), and all the autonomous vehicles can still fill in around them. You can still have smaller local delivery vehicles. How annoying is it to see a massive beer truck block the entire road simply to roll out one load on the dolly...? muncien wrote: You can still have smaller local delivery vehicles. How annoying is it to see a massive beer truck block the entire road simply to roll out one load on the dolly...? Wow, I had never considered this, but that would be very cool to see. Maybe we could take it one step further and have drones deliver locally (I'm not sure how 'small' we are talking here, but perhaps a fleet of drones could cover the actual delivery). The possibilities are honestly endless when it comes to self driving cars, it's just a shame that this is still so far off. And yes, good point about the larger trucks taking up two smaller lanes. That's sorta what I had envisioned, except physical lanes would be gone, and the fleet of cars would just adapt and create 'lanes' as needed. muncien wrote: I don't think it negates your idea... If the trucks are automated as well, they simply take up TWO of the new smaller lanes (at least for interstate travel), and all the autonomous vehicles can still fill in around them. You can still have smaller local delivery vehicles. How annoying is it to see a massive beer truck block the entire road simply to roll out one load on the dolly...? Have you looked at local beer delivery trucks and trailers recently. Many trailers are half the height they used to be, probably to fit under the canopies at the local 7-11 or gas stations. Local delivery trucks run routes much like buses, few drive straight from the warehouse to just one store and then return directly to the warehouse. They drive from the warehouse full to the first store , and then to many other stores before returning back to the warehouse empty. Have you ever seen your average everyday school buses never run a route? Have you looked at local beer delivery trucks and trailers recently? Many trailers are half the height they used to be, probably to fit under the canopies at the local 7-11 or gas stations. Local delivery trucks run routes much like buses, few drive straight from the warehouse to just one store and then return directly to the warehouse. They drive from the warehouse full to the first store , and then to many other stores before returning back to the warehouse empty. That truck with just one load on the dolly at a store is at just one store on its route servicing many other stores. Autonomous vehicles will not suddenly replace all other vehicles overnight. My car is a 2007 model and I plan to drive it another 10 years. I'm not the only driver in the metroplex wishing to do the same. electricron wrote: Autonomous vehicles will not suddenly replace all other vehicles overnight. My car is a 2007 model and I plan to drive it another 10 years. I'm not the only driver in the metroplex wishing to do the same. I know that's right! My truck is 2002 and I'd like another ten years, too. Definitely agree with you there, which will make this process that much longer. After autonomous cars hit the road, it'll probably be another two decades before most cars are autonomous. I'm still driving my 2004 model car, and am really trying to hold out for autonomous cars. Even though individuals will be slow to upgrade, you have to keep in mind that we have companies like Uber/Lyft who are desperate to use autonomous vehicles. I'm hoping that I won't have to buy another car and I can just rely on Uber/Lyft to get around by that time. I guess it'll come down to what the cost will be, but I work from home, and I'll be living in Uptown later this year, so I'd imagine I can get by not owning a car. 1. Isn't this exactly the kind of accident we are expecting autonomous vehicles to prevent? 2. How did the sensors NOT identify this as a pedestrian, or even obstructive obstacle of some sort? She didn't exactly leap off the sidewalk in front of the vehicle (as their original verbiage seemed to indicate)... It appears she had already crossed a lane or two of traffic at a leisure walking pace before being struck. 3. How is the driver NOT being charged here? So long as uber has a human at the wheel, that human MUST have some responsibility. Otherwise, what is the point? Had video NOT shown that she was clearly distracted, she would be off the hook... but instead, the is in there texting away. I'm sure there is much more to discuss... but this is what comes to the top of my mind. I heard about this incident, and, obviously this is a huge tragedy, but I wanted to still believe in the technology and believe that maybe this was an incident where it was impossible to not hit the pedestrian. I, too, just watched the video, and it definitely looks like the car could have and should have avoided this person, or at least attempted to stop. Apparently (according to reports) the car was driving 40 mph and there were no indications of the brakes being applied. I will say that if there were a human driver behind the wheel, I think the same outcome would have happened. The pedestrian was crossing the street at night wearing dark clothing, but that isn't an excuse for the autonomous vehicle. I would expect the autonomous vehicle to be able to detect and react to situations like this much better than a human driver. Hopefully the next unforeseen glitch will not be as tragic. I'm shocked the Lidar didn't pick up the pedestrian at night..not a good look. But to be fair, the pedestrian holds a lot responsibility here. She was being stupid; just casually moving along like nothing. She also didn't cross the street at a crosswalk area. She has to cross the street quickly and especially at night! Why even assume the driver will stop or slow down? Tragic mistake. With that said, I don't know what will come of this case. If it weren't an accident involving an autonomous vehicle; would we even be hearing about this? The pedestrian in this situation would get the blame she clearly was distracted and jaywalking. I don't know if the driver can get the blame. Sure you would like them to stop but what if the person at the wheel did not see the person...their job is to test is it not?..how can they test something or prevent something at night.... it's a very delicate situation. I wish the human intervened. Last edited by Tivo_Kenevil on 22 Mar 2018 09:52, edited 1 time in total. Also, these vehicles need to be tested at 25 mph. Why even go 40? Hopefully this is the first and last. This is completely unacceptable. These cars should be going through an insane amount of testing before we even consider putting them on the road. I don't blame the human driver of this car, but, based on the video, it was clear that she was distracted at the time of the accident. There should be some extremely strict rules set on whatever human is in the vehicle and they should 100% be focused on the car and the road. With that said, I don't think the person in the car could have done anything to prevent this, but she should have at least been less distracted. I'm not sure what Uber was thinking allowing this vehicle on the roads. I'm afraid that maybe these companies are getting into a bit of a war as to who comes out the with first consumer self driving car and, because they are competing, they are taking shortcuts which could have resulted in this. I'm not sure what lead to this, but I'm hoping this drastically changes the way these companies are working on this technology. Tivo_Kenevil wrote: I don't know if the driver can get the blame. Sure you would like them to stop but what if the person at the wheel did not see the person...their job is to test is it not?..how can they test something or prevent something at night.... it's a very delicate situation. I wish the human intervened. After watching the video, it seems unlikely the human could have done anything to prevent this. I think she should have had her eyes on the road at all times, but, again, I don't think, in this specific case, it would have made a difference. Tivo_Kenevil wrote: Also, these vehicles need to be tested at 25 mph. Why even go 40? Exactly! It's very scary to think that this car was not capable of detecting this pedestrian. This isn't some extreme case where it starts hailing, there's a tornado nearby, and the roads are underconstruction, or something crazy. This was a pretty standard situation where it was night time, the car was going the speed limit, and a pedestrian was (dangerously) jay-walking. If the autonomous car is out on the roads in the real world, I would like to think that this situation would have been something it could easily handle (detect the person crossing way in advance and begin to slow down ahead of time in case that person comes into your lane). With LIDAR in use... this should never have happened. I understand they have to program it so that it doesn't stop for every little obstacle that happens to be 'close' to the lane of traffic, but this is different. The LIDAR is intended to give a full picture of the surroundings, and the AI must surely recognize that this 'obstacle' (assuming the combination with bicycle may have made it hard to recognize as a pedestrian) was IN the lanes of traffic and acted accordingly. As for whether this was unavoidable... I realize the camera makes it appear that she 'came out of nowhere', but I too have a dashcam installed in my car and it doesn't tell the whole picture. Dressed in dark clothes or not, she has a flippin bicycle with her which emits some sort of reflection without a doubt. The human eye (had it not been looking at a text message), and the high tech gear on this vehicle no doubt would have recognized her (even in the dark) and attempted to evade or stop. Yes... The pedestrian is legally at fault here. But the car should have been able to avoid or reduce this incident, without a doubt. Until that fault is addressed, these vehicles should be grounded. And by the way... If the 'driver' is not going to be responsible in any way, than get them OUT OF THE CAR so we have clear levels of responsibility here. Their very existence may be why UBER felt they could get away with not have worked out all the kinks yet, and have things driving all over the place with a false sense of security. Yeah. The pedestrian just appears out of nowhere in the video. Tragic. I think she should have had her eyes on the road at all times, but, again, I don't think, in this specific case, it would have made a difference. This case actually illustrates the problem with expecting a human driver to step in to compensate for an autonomous car's failures. If the robot is doing a halfway decent job of driving (like this one mostly was until it wasn't) the job is insanely boring, and the human driver looks away and daydreams. Just to be clear, I do not expect the human driver to step in here, but I still don't think the driver should be distracted. Sure that's boring, and pretty much pointless, but you're one of the first people in the entire world to test this brand new technology, so I don't think it's unreasonable to expect their full attention. But yes, the idea is to actually test the self driving car, meaning, even if the human wanted to intervene, the proper thing to do would be to give the car a second or to react before intervening, and, in most situations, by then it's too late. Driving is already a monotonous boring activity which is why people get distracted driving in the first place. Now you are going to take some of the "activity" away that keeps the mind occupied and of course, the driver is going to drift off from focus. I certainly don't get the point of riding in an autonomous car if I have to sit there even more bored staring at the road. I understand we are in testing so paying someone to stare at the road is a requirement at this stage. I also know what its like to get hit by a car crossing the street cause I was and I was in a crosswalk. The sun was setting and the driver was more focused on the turn signal than me crossing legally. I even took out my headphones and put my phone away before I crossed. I still trust the computer to turn out better safety standards than humans as we develop the software and tech. This sadly will only assist the fear mongers who undoubtedly point to this as proof the tech will NEVER work. It's a terrible situation but humans are humans and they make mistakes and that includes when designing their tech. God made mankind in His image and mankind makes its tech in its own mistaken ridden image. cowboyeagle05 wrote: I understand we are in testing so paying someone to stare at the road is a requirement at this stage. Yeah, that's kinda what I'm getting at here. The person driving the car is 1 out of maybe 100 people who has been given the chance to 'drive' a self driving car. At this stage in the game, it just seems like they should be more strict on this stuff. I also acknowledge that staring at the road won't really change anything and is pointless, but I'd still like to see someone take this stage of testing more seriously. cowboyeagle05 wrote: It's a terrible situation but humans are humans and they make mistakes and that includes when designing their tech. I think we are cutting the people behind this incident too much slack. Yes humans make mistakes, which is why software goes through rigorous testing, and once you're done with that testing, you test safely in enclosed environments or with simulations or whatever. Then you start slow in the real world at slower, safer speeds. This car was not fit to drive on the roads it was driving on, and it's crazy to me that this was "Okay'd" by the company. Again, this situation wasn't even all that complex. It was somebody jaywalking, and the computer failed to handle the situation correctly. I am not giving them slack I want to be clear it's not ok that someone died during testing of technology. What I mean though is just that tech is not perfect and is more likely to mess up because it is designed by humans. I see what you're saying. I can understand one human making a mistake, or even a couple of humans. But technology like this just goes through so many tests from so many different people, and they (should) have been doing so for years now. If the circumstances were more extreme, I'd be more understanding, but this was just a case of a careless person jaywalking. I would have thought that self driving cars would be able to see this person well ahead of time, slow down their speed significantly, and then even stop if they need to. The person who was hit managed to cross over a couple lanes before entering the self driving cars lane, and she looked like she was just walking, so that did give the car time to react at least a little bit. Maybe the original video is just low quality so it makes it look darker than it actually is? Not that I think darkness is an excuse. We aren't talking about a human eye, we're talking about technology with sensors.